Champagne is the name of an ancient French province, which is now the appellation d'origine contrôlée (AOC) adopted by usage and regulation to designate the worlds foremost sparkling wines. 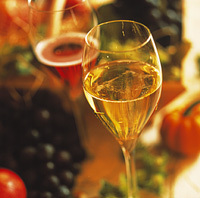 Usage and regulations have defined the Champagne winemaking method since its origins in the late 18th century. This method is known as the méthode champenoise. The term Champagne is exclusively reserved for wines produced in the Champagne region according to the prescribed methods. All of the steps in the méthode champenoise are described in detail and stipulated in EEC regulations. Champagne winemaking technique: Méthode Champenoise or traditional method. Since 31 August 1994: Sparkling wines other than Champagne can no longer be labelled as méthode champenoise". Only the term méthode traditionnelle or traditional method can be used.